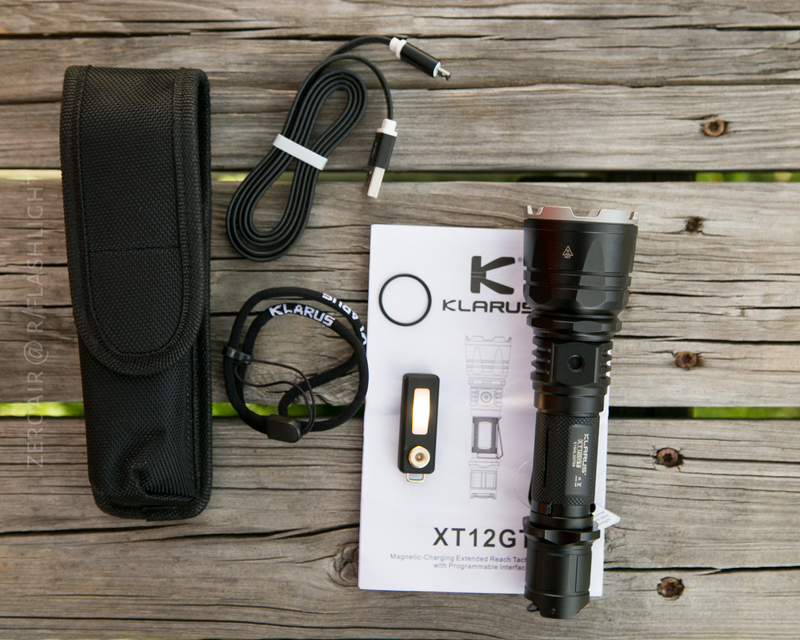 BestLight.io sent over this Klarus XT12GT for review. I’m pleased to be working with BestLight, and pleased to have this XT12GT – I have an XT11GT and like it, and I was interested to try the novel charge mechanism on this one! Just one version of this light! The MSRP looks to be about $94.95, with a street price of the same. I love the form factor. I love the charge port and the even the mini keychain charging adapter. This is a very nicely featured light, with many features I like, and two I don’t. 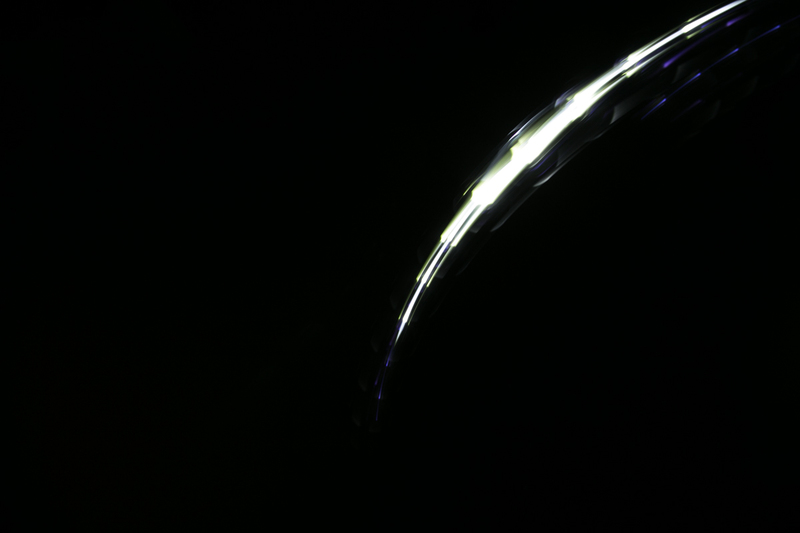 Here’s the photo album and beamshot album, and of course the runtime and chargetime, too. Klarus has stayed with their standard packaging here. This is a nice, display-ready package with a hang tag and a window into the light itself. The box is quite descriptive, and printed on all sides. The back has features and modes and…. quite a lot of useful information. The manual is also very well done. Even the UI, with it’s two mode groups, is explained nicely. It’s kind of a flow chart, or “UI Tree” if you will, but it works quite well. 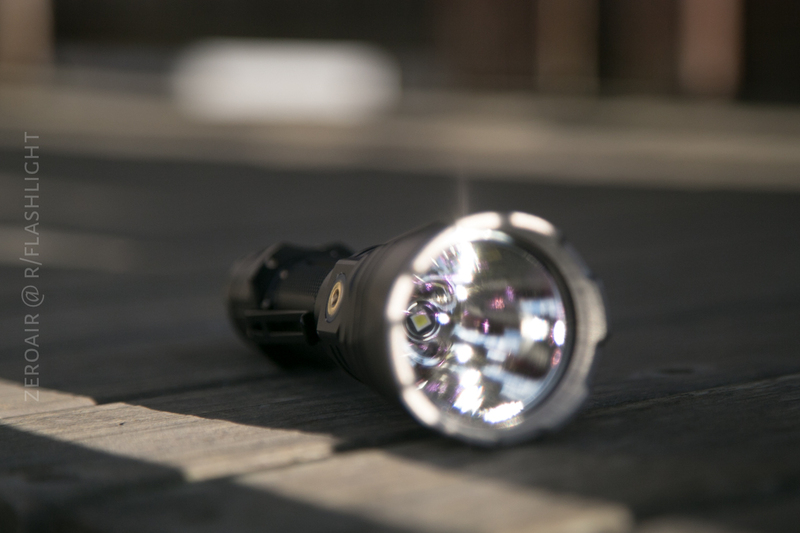 The XT12GT is much like it’s smaller sibling, and for that matter, like all the Klarus lights I’ve handled; quite well built. I have zero complaints about anything in the build of this light. In fact one of the things (BQ related) that I was prepared to hate, I actually was pleased about: The charging port on the light itself does not have live voltage! That’s a win in the BQ category if there ever was one. Disassembly is quite easy. And most of this light comes apart by easy unscrewing. The bezel, the head, and the tail all unscrew easily…. But the “head” isn’t actually what we normally think of when we say that. In this case the emitter/driver etc actually stays with the body of the light. Intuition tells me that this part will unscrew too but I can not make it. As a result of this, I’m not sure what the potential for an emitter swap on this light is. And you’ll probably want one… more on that later. Here are a couple of scale photos. There are three main ways to retain this light. First, and installed on shipment, is the pocket clip. It’s a very simple clip and not really anything special. But it still gets the job done. The shape of this light really doesn’t lend itself to clipped-carry anyway. But there’s a pouch included, and the light fits inside very well. 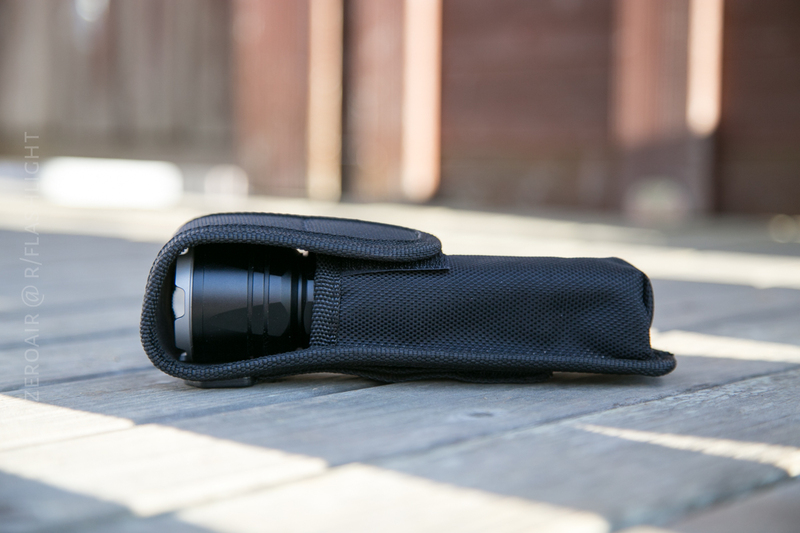 The pouch is a fine one, with a belt loop on the back, and plenty of room for the head in a bezel-up style. Finally, there’s the lanyard. It’s a nothing-special lanyard which gets the job done just fine. It connects on either the tactical ring or the pocket clip if you’re so inclined. Another way this light can be retained that I almost published without mentioning: There’s a 1/4″ screw thread – just like a tripod head has. This light can thread onto those type connectors with it’s built in threads! A very cool feature, if maybe not all that useful for many users. Either a single 18650, or two 18350 will run this light. In fact the working voltage is 2.5V-8.4V. 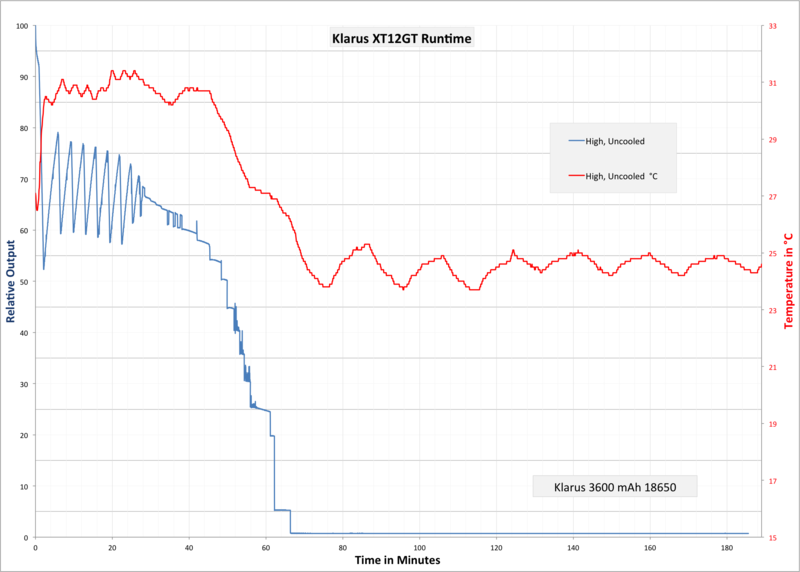 (Of course Klarus only quotes 18650 and 2x CR123A, not 18350.) 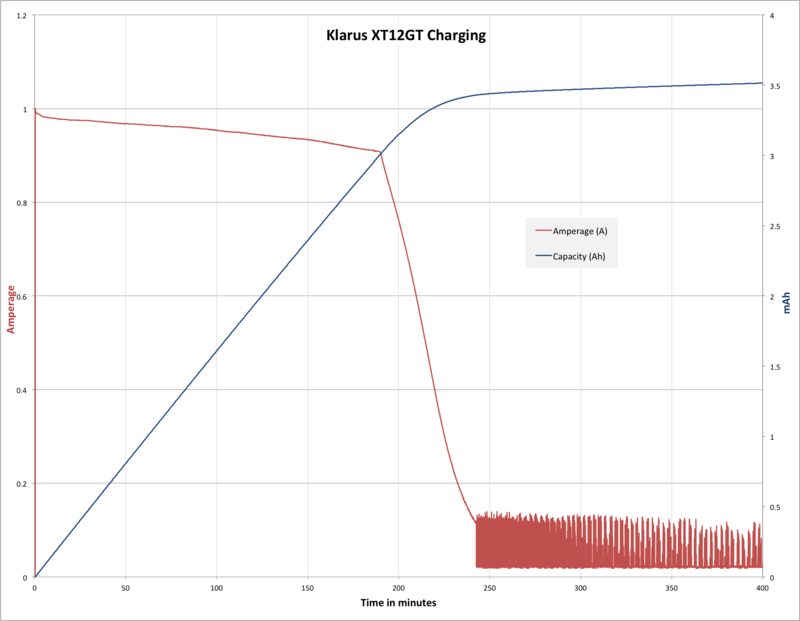 Klarus makes no claim that the 2-up cell will provide more output, however, so there seems to be no big advantage except compatibility. As I state above, there is not live voltage across the charging port on the light itself. I measured 70mV across the charge terminal on the light. I did measure about 1.9V across the terminal on the charge adapter, however. I don’t consider this too big of a concern though. The runtime test never properly terminated , but voltage was 3.01V when the battery indicator was solid red (on startup of the light, not during operation!). Solid red, according to the manual, means <30% charge, and that’s when and why I stopped the test. At that point, the output had diminished to below “low” mode, anyway. There is actually one lower warning, where the red will flash instead of solid. Klarus claims 1A charging on this light, and the light did hit 1A charging briefly at the very beginning of charging. On average the rate was >0.9A though, which isn’t too shabby at all. (To be fair what the manual actually says is that the charger has a max charge current of 1000mA, which the light did in fact achieve.) . The chargetime also confirms the capacity of the included cell, at approximately 3500 mAh – slightly lower than the rated “3600” but more like what we’d expect anyway. There are two tail switches on this Klarus. The round rubber-covered one is a forward mechanical clicky, and the paddle switch is an electronic switch (which functions mostly like a fw clicky). The round switch is the Primary switch. The paddle switch is the Mode switch. First thing to note is that there are two entirely separate mode groups for this light. One is the “Tactical”, the other is “Outdoor”. I’ll be honest and say I don’t remember which the light shipped with, but here’s how to switch between them: With the light off, hold the Mode switch. After ~10s, the light will begin to flash. (This is subtle in Outdoor group (where the mode switch enters Low) but not possible to see in the Tactical group because the Paddle switch activates strobe. Best bet is to just count 11s, and then do the next step: Click the Primary switch. And now you’ve changed the group. There’s no confirmation you’ve done so. Just turn the light off, and hit the paddle: if it’s “low” then you’re in Outdoor Group. If it’s strobe, then you’re in Tactical. Now let’s concern ourselves with the Tactical Group. Here’s a table. There are a couple of caveats to the Outdoor Group. Foremost is that since the FC has a momentary turbo, which works from any mode, turning the light off always activates turbo. EXCEPT when the light is turned on to low with the paddle switch, in which case the paddle switch may be used to turn the light off without going through turbo. (Further proof that this has an electronic and mechanical switches.) But this is probably a setting you’ll want to know (otherwise going through turbo for off can be annoying.) To wit: if you’re using this in Outdoor Group, I’d recommend you turn the light off and on with the paddle switch! * This category is as yet meaningless since I don’t have a calibrated sphere. I’m still recording these values, and working on calibration. I found two noteworthy things regarding the modes. Turbo has a noticeable bit of inductor whine. It’s not annoying, but I can hear it. More problematic is this: Low has very noticeable PWM. I’m extremely PWM sensitive, and I can see it with no effort whatsoever; if you don’t tend to notice PWM, then I doubt you will on this light either. The emitter of choice here is a Cree XHP 35 HI D4. I have [at least] one other XHP 35 HI light and I happen to love it. I’ll say it up front: this XHP 35 HI is cool for my tastes. I do think this is common in a weapon light, though, so you probably won’t be surprised by the tint. The crenelations on the bezel are also quite dramatic: they cause the edge of the beamshape to be quite …. toothy. After 4 or 5 meters you probably won’t notice this, though. And it’s not a problem up close, just noteworthy that it’s not a smooth edge. A smooth reflector makes a very intense spot, but I didn’t measure throw to be quite as good as stated. Rated at 603m, I measured 513m. Still a very throwy light! The spot is so intense in fact, that one might not even notice the spill until the highest mode. 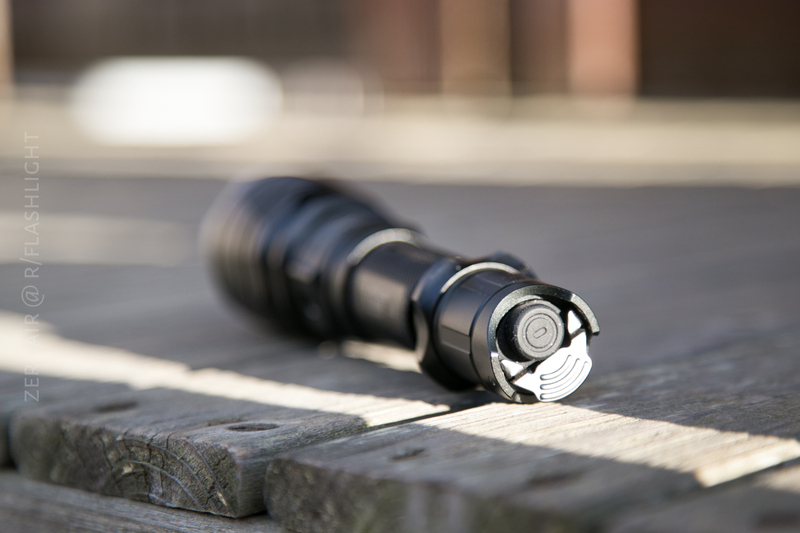 Armytek and Eagtac both have competitive options to this Klarus. The Armytek Doberman Pro and the Eagtac S25L-R. Both of those have smaller reflectors and are rated for a bit less throw (with the Eagtac being rated for much less throw). 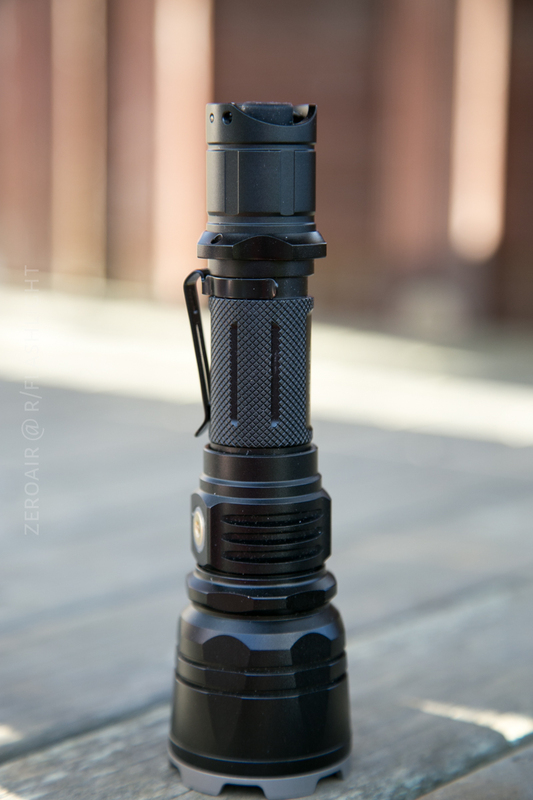 The Armytek offering has only one switch (as far as I can tell). The Eagtac has a forward clicky with a novel head-twist for mode selection. Between all those other options, I prefer the Klarus activation. I’d love for you to go to BestLight.io if you want to buy this light! I’ve had a little interaction with these guys, and they’re good people. 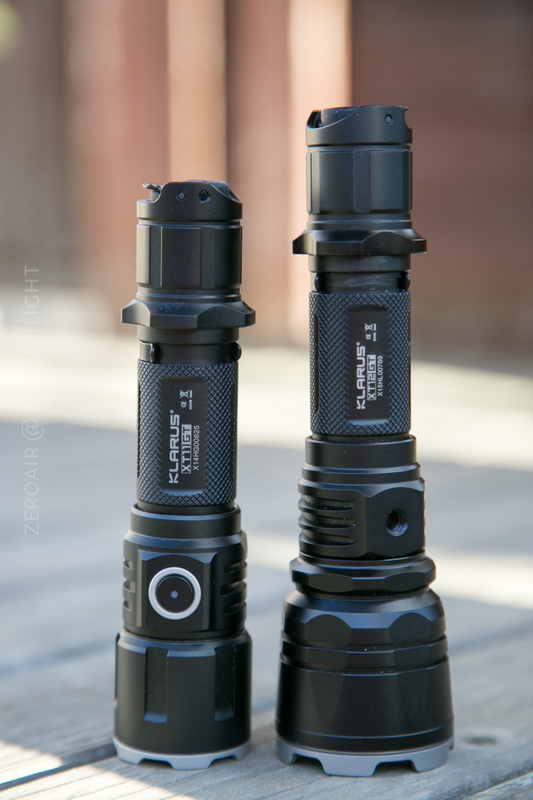 I will have the Lumintop Torpedo 007 early next week, and the Lumintop SD Mini soon after that. This light was provided free of charge by BestLight.io, for the purposes of this review.